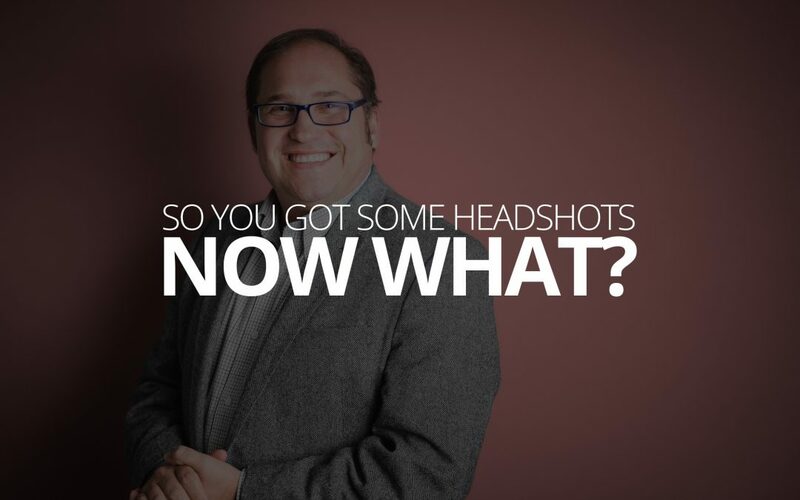 So You Got Some Headshots, Now What? As a society, we’re well past the discussions of what kind of professionals need a headshot; gone are the days of just real estate agents and actors. The answer, today, is almost all of them. If you’re running a business (of just about any kind), if you’re trying to get a job, if you’re trying to sell something, if you’re trying to get attention, or trying to get remembered, a headshot should be right around the top of the list, along with things like a business plan, a resume, or a business card. But, once you get that headshot, assuming you’ve hired a photographer who is thinking broadly about the purpose of a headshot, you’re still not quite done. You still have decisions to make, and just indiscriminately plastering the photo everywhere is probably not what you want to do. Unfortunately, most photographers are not in the business of helping you use the photos they make. They usually just make them and leave the rest up to you. Now, I don’t want to make it sound like these decisions have some kind of cosmic gravity to them. Truthfully, at the end of the day, having a good headshot is way more important than using it to its maximum potential. Don’t let perfect be the enemy of good, as they say. But, the thing you’re doing—whatever it is—well, everyone else is doing it too. So, for a lot of people, doing the basic stuff even a little bit better than the next person, can make all the difference. So today, I want to talk a little bit about the nuances of how and where and why you should use your headshot, in hopes that you’ll consider it a little bit more carefully than the next person vying for the same people’s attention, or time, or memory. Lets dive in. Headshots are sometimes literally just a photo of your head. If that’s what you got back, well, there’s not much else you can do with the photo besides put it up wherever you think it needs to go. But, a more foreword thinking photographer who is considering the diversity of contexts your image might appear in, will provide a little more wiggle room by creating the image from further back, allowing some space to crop the photo for various uses. In some contexts, a very close crop, from the top of your head to the bottom of your neck, is ideal. In others, you might want the image to be oriented in landscape (horizontally), or from further back to include most of your torso. We’ll talk about the specifics as we move into the different sections below. The important thing to know is that the headshot you got back, depending on how you’re using it, may need to be cropped. That’s not an indictment of your photographer’s skill or eye, but rather a natural consequence of a versatile image. LinkedIn, unlike other social networks, is deliberately intended to help you make real life connections. In other words, LinkedIn isn’t as much about content as it is about tangible connections, and one of the best ways to stick in people’s minds and get recognized at networking events, job fairs, or even at the job interview, is to make your face easily recognizable. A LinkedIn profile picture is not typically the place to make a statement about style or taste. It’s more about taking a place in people’s memory. So, your LinkedIn profile picture is a context where you’ll want your photo cropped in, just below your neck and just above your head. LinkedIn profile pictures are also usually displayed in squares and circles, so you’ll want to crop the image into a square, with your face as close to the center as possible so that it looks good both ways. Furthermore, because your LinkedIn profile picture should help people remember you, you should avoid changing it except rarely. Maybe once a year to keep up with your image and hair styles. On a related side-note, you might also consider keeping the lighting style in your profile pictures reasonably consistent between changes. Beyond LinkedIn, other social networks and forums are also a good place to use your headshot. However, the way those networks are used varies dramatically from industry to industry, making it difficult to give advice that is broadly useful. That been said, there are some things to consider. By the nature of the platform, people on Facebook have a tendency to expect a more personal profile photo, and to see a somewhat more candid version of you, or what interests you. In many industries, that might just mean weekend clothes and sunglasses, rather than sport coats and cufflinks. Twitter, on the other hand, depends much more on the attitude you use when you post things. If you’re funny or snarky, a photo that implies those things is a good idea. On the other hand, if you’re serious and maintain strong professionalism at all times, you’ll want your headshot to agree. On Twitter, the voice you speak with matters, too. If you say “we” a lot, rather than “I”, you might want to consider using a logo or some other graphic rather than a headshot. Likewise, Instagram is a more creative community than other networks and you might consider choosing something off-beat to represent you, or skipping the headshot entirely in favor of some kind of graphic that fits the style of the sorts of images you post. Aside from profile photos, if you have a headshot in a landscape orientation, then you might consider using it as a header image on Facebook and Twitter. Of course, depending on your industry, that might be a little heavy handed. So ultimately, when it comes to social networks other than LinkedIn, it’s important to have some concept of what you want people to notice and remember—you specifically and personally, or your brand generally? When you get your headshot, putting them on your website is a no-brainer. People may find you in myriad ways, but virtually all of them, if they intend to do business with or hire you, are going to check out your website. So, the audience on your website, at least for a moment, has given you a greater share of their attention. They’re choosing to look at your message free of the noise from social media. In this context, they’re far more interested in looking into your image, rather than just at it. Your website becomes a perfect opportunity to use a little more nuance in your image. To show a little more of yourself, in the way you’d like to be shown. Beyond just a simple head-and-shoulders headshot, your website is hospitable to bigger more descriptive images. Images of you at work, images of you in your element, images of you being you. If you’re working with good web designers, marketers, and branding professionals, tell them that you want to use your website to help people remember who you are. If you’re not working with those people, that’s okay for now, but talk to you photographer about what your audience cares about. The “profile photo” on social media has changed our expectations of networking forever. When you hand someone a business card without a face on it, more often than not, it just becomes one of a bazillion business cards that didn’t have enough identity to not get thrown away. If I’m holding 10 business cards for accountants, and only one of them has a face on it, can you guess which one I’m calling first? Right, it’s the one that lets me picture the person on the other end of the phone call. Don’t use generic business cards with generic information—the person handing the card out is who we expect to speak to when we call. Put your own information on there, and put it right next to your face. If you do print marketing for any reason, that print marketing is an excellent place to use your headshots, because it helps people envision what their professional relationship with you might be like (that’s a double edged sword, of course, so tread lightly). Ultimately, how you use the headshots depends a lot on what industry you’re in. For example, if you’re an author, a freelancer, or pretty much any kind of consultant, using a headshot prominently is probably a good idea—much in the same way as on your business cards. But, if you’re a team of people, perhaps a group photo is a good idea, or even a panel dedicated to pictures and short bios for everyone on the team. The goal in this print marketing is to help people develop a narrative and picture what working with you will be like. Photos, in general help with that. But, photos that you are in, or the actual people they will be working with are in, are even better. It’s a good idea to work with a marketing or branding professional, or a job recruiter, to help you make the best decisions for your goals. But, if you’re not able to enlist the help of one of those professionals, just decide whether people need to remember you specifically, or need to remember what you do generally. If the former, then just put your photo everywhere. If the latter, then get a killer logo and use that liberally, and photos of you sparingly.